Our modern luxury caravan has many extras that will make your holiday enjoyable and memorable. The lounge has one free standing 4 seater settee, 1 two seater settee, electric fire, 40inch flat screen TV with freeview . Built in sound system. 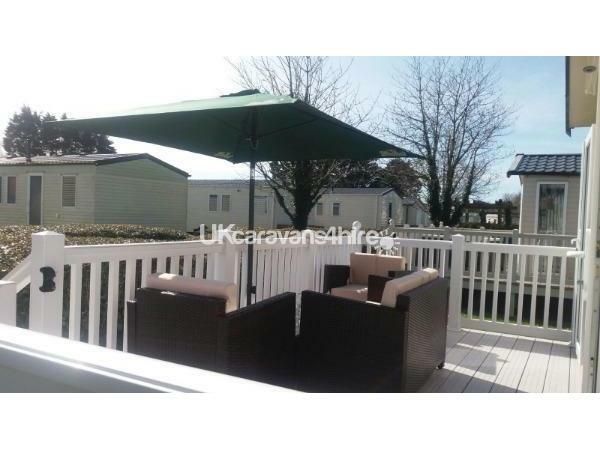 Patio doors open onto new UPVC decking which also extends down the side of the caravan, ideal for children, and also ideal for that sunny day BBQ. Rattan furniture also provided. The modern kitchen/diner has ample cupboards, free standing gas cooker and cooker hood, large fridge freezer, microwave, kettle and toaster, dining table and 6 chairs. All utensils and crockery are provided. Iron and ironing board are also provided. Second bedroom has 2 single beds and wardrobe, flat screen TV with freeview. Third bedroom has 2 single beds and wardrobe also TV. We supply duvets and pillows you supply your own bed linen. Master bathroom has large shower, WC and wash-hand basin. Our Caravan is situated in a safe area for children yet near to entertainment complex, shop, park and beach. Gas and electric included in price. A carbon monoxide detector and smoke alarm are fitted for your safety. WE DO NOT HIRE OUT THE CARAVAN FOR WEEKENDS. WE HIRE OUT SATURDAY TO SATURDAY,SUNDAY TO FRIDAY/SATURDAY OR MONDAY TO FRIDAY/SATURDAY. Passes to the Entertainment complex can be purchased on arrival at the main office. A deposit of £100(non-refundable) is required on booking, the balance to be paid 6 weeks prior to your holiday. BOOK EARLY FOR 2019 TO AVOID DISAPPOINTMENT. We love our caravan and we are sure you will love it too. Please telephone the 2 numbers listed above for a prompt reply as we are not always in a situation where we can access our e-mail account. Thanks.